Leaving aside any judgement on the qualities of Richard Bean’s Great Britain, we must first applaud those involved for what the play attempts – an immediate response to the biggest domestic news story since cash for questions – and how – in the world of social media – they managed to keep it under wraps to pretty much everyone. There is a certain irony in a play entirely focused on leaks, hacking and exposure being kept secret right up into previews – and that it was achieved by the country’s biggest theatre company, with a lead who has been forced to grow-up under the bright glare of the tabloids’ flashbulbs is a remarkable achievement. Richard Bean proved with his artfully balanced adaptation of Goldoni’s One Man, Two Guvnors that he is capable of broad comedy that captures the public imagination. The play operated as traditional British farce whilst simultaneously deconstructing the genre by breaking through the fourth wall and toying with the audience’s expectations. That it was a success was probably to be expected – with James Cordon reconfirming his exceptional comic talents after a series of mediocre moves in TV and film – but the fact it has become a global mega-smash was not predicted and must have placed an awful lot of pressure on Bean for what he would come up with next. That his response was to attempt something as ambitious as Great Britain demonstrates he is a man clearly up for a challenge, and it is pleasing to see how admirably he has risen to it. With Great Britain he tries another form of alchemy in attempting to blend the mechanics that drive farce with an attempt to explain a highly complex and incredibly serious series of events that do not deserve to be treated lightly. It is as if Bean was attempting to create the lovechild of Michael Frayn’s Noises Off and Democracy. Bean doesn’t succeed in what may have always been an impossible proposition but it is undeniably great fun to see him try. There are an awful of laughs in the show and they come from all angles; from the wonderful faked headlines of the papers – right up to the Guardian’s tagline of ‘we think so you don’t have to’ – to the ribald language of the tabloid’s newsroom, which masks an amazing felicity of expression among the journalists. The play takes a number of sacred cows and turns them into hamburgers, and as a result the air is thick with gasps followed by laughter. 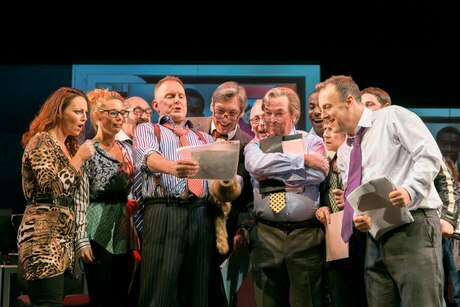 Taking these jokes right to the edge of acceptability is absolutely necessary for the play and it should create an interesting, and uncomfortable, tension for the middle-class, liberal audience members busy reading the Independent on their smartphones, whilst pretending that they are not keeping one eye on the Daily Mail’s sidebar of shame. These are the jokes that if told by Jim Davidson on Southend Pier, or printed as headlines in the Sun on Sunday, would express a mutter of disapproval. They would certainly finally cost Jeremy Clarkson his position on Top Gear. However if expressed on a publically subsidised stage in the name of irony then it is fine; watching Great Britain leads to thinking that the hoary old trope that is wheeled out on such occasions – that context is everything – does rather smack of the liberal intelligentsia have their cake and eating it; the 21st century equivalent of a Victorian pater familias decorously covering up the table legs before having it away with the housekeeper. It is a difficult balance and no-one wants to be like the po-faced bloggers who act as a self-appointed guardians of public morality and display an approach to controlling what other people should say and think that would make Orwell’s O’Brien proud. Then you see the other side of the spectrum and realise that the alternative are people who genuinely believe in the crap they spew forth, and suddenly libertarians and the championing of freedom of speech seems a whole lot less appealing. Great Britain judges it well and is ably supported by some inspired casting; Robert Glenister has always looked like he was born to edit a tabloid newspaper and there is something of the noble bulldog about him as he appears to be playing the kind of editor that only ever exists in the imagination of scriptwriters – charismatic, witty, bursting with energy and sticking ferociously to their own ethical code at all costs. Oliver Chris is equally well cast as the Assistant Commissioner to Aaron Neill’s hapless Comissioner. 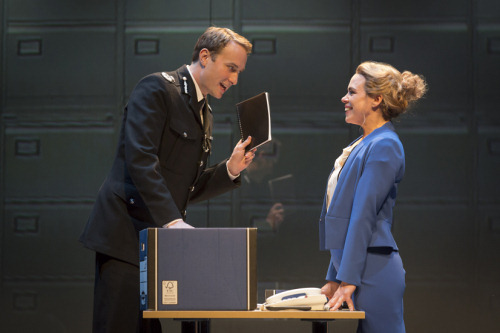 Having come straight from the Almeida’s fantastic King Charles III where he played William, Chris is on a role and he is ramrod straight as the Russell Group graduate who flies through the ranks without ever getting their boots dirty and proving the simplest of prey to Billie Piper’s terrifyingly carnivorous Paige Britain. Clocking in at 3hrs it is too long, and it is not hard to imagine that up to 30min could be cut before it transfers to the West End. Comedies need to be razor sharp and run at pace, although there is so much story to be told that even three hours can only cast the briefest of lights on this sordid piece of history. It is clear from the outset that this both is and isn’t the story of the News of the World – really this is a story of tabloid culture and the complicity of the system in allowing it to happen, and to an extent the complicity of the audience who tweet about the latest Miley Cyrus disaster, who share BuzzFeed’s 15 unfortunate celebrity photoshop fails and who refuse to recognise that they are buying into exactly the same obsessions as the readers of The Sun or Take A Break. Great Britain is not without flaws but it is an impressive piece of work, and proves Richard Bean as a comic dramatist of the highest order. 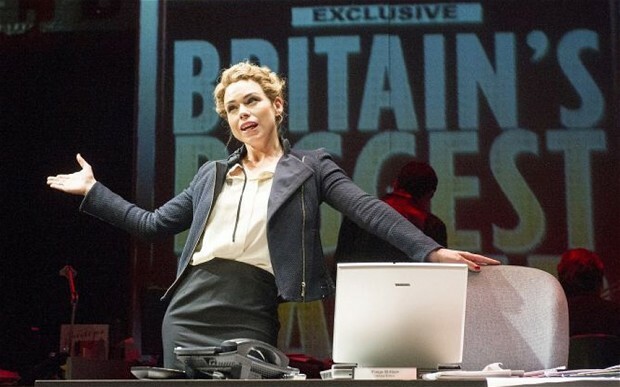 It is exactly the sort of play that the National should be commissioning and proves that new, politically engaged plays do not have to be written by David Hare and can be funny – both valuable things to have learnt.